"Anthropology in Theory is a dazzling collection and Moore and Sanders have impeccable taste in theory. Their selection of readings–––an exhibit of famous voices (from Boas to Bourdieu), visionary positions (from functionalism to poststructuralism) and clarion and root concepts (from cultural pattern to cultural hybridity)–––is not only well–designed; the book is certain to be a boon to the practice of teaching anthropology in the new millennium." The 57 articles collected in this volume–––together with the editors introduction–––provide an overview of the key debates in anthropological theory over the past century. 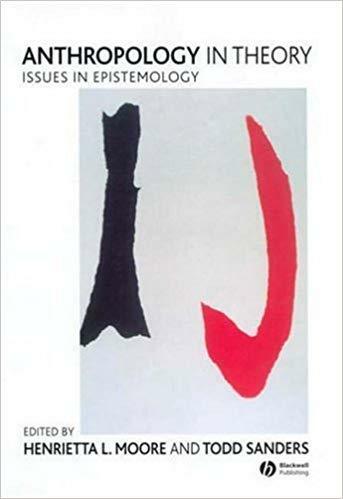 Provides the most comprehensive selection of readings and insightful overview of anthropological theory available Identifies crucial conceptual signposts and new theoretical directions for the discipline. Discusses broader debates in the social sciences: debates about society and culture; structure and agency; identities and technologies; subjectivities and translocality; and meta–theory, ontology and epistemology.